From the outside, Zenith Supplies in unassuming, and it’s hard to tell what is being sold behind the plain black sign and simple red storefront. Zenith has been in its current location for 10 years. But inside, there are products for massage, DIY body care products, candles, homeopathic remedies and other new-age knick knacks for sale. The company began in 1975 when owner Jacob Griffis, a certified massage therapist, was having a hard time finding a good massage table. Instead of searching, he decided to make and sell them himself. Once he realized it was too labor-intensive, he expanded the business, but still sells U.S.-made massage tables. The store transformed in response to what people in the community were looking for, employee Liz McCarty said. Often times people will travel from other states to test the products in store and avoid the expensive shipping costs. Now, the store services a variety of clientele, from massage professionals, DIY and crafters, and the medical marijuana industry. 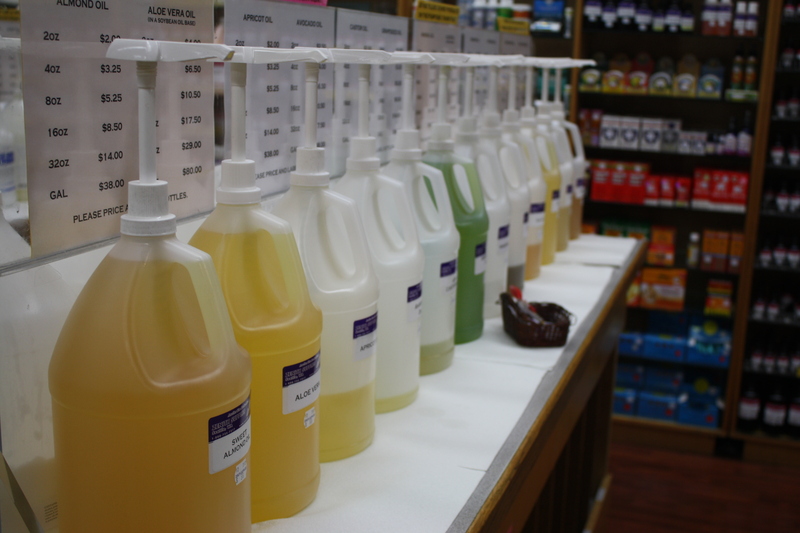 Zenith sells their lotions and oils in bulk. While everyone else was noticing a decline in business as the economy slid into the recession, Zenith was still going strong. McCarty thinks that has to do with an increased interest in making things from scratch. “It seems like there’s an increased interest in sort of moving away from pre-made stuff and experimenting with personalizing it yourself,” McCarty said. There is also an interest in moving away from products with harsh chemicals, she said. This is especially a problem for people with sensitive skin or skin conditions, like eczema, McCarty said. Many times, people with these problems don’t necessarily want to make their own lotions and body products, but they do out of necessity. 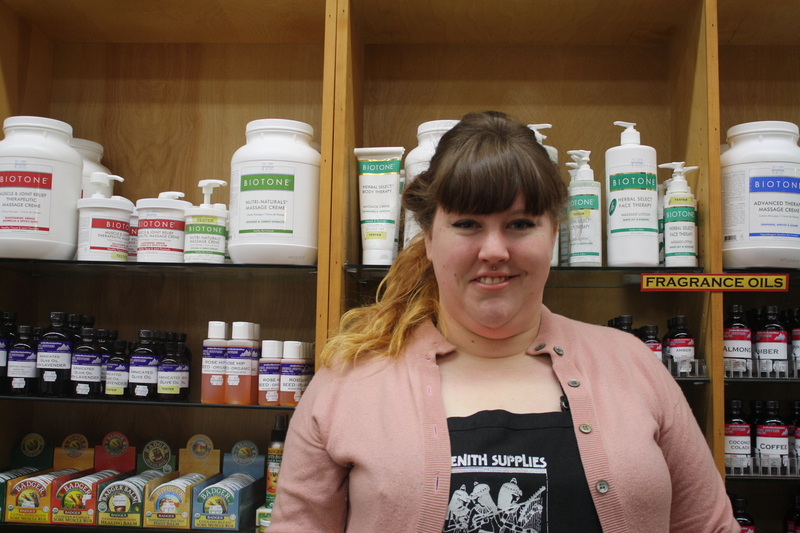 One of the big draws to Zenith for local crafters are the DIY supplies for body care, soaps, and candle making. The products are sold in bulk, which means the more customers buy, the cheaper the product gets. 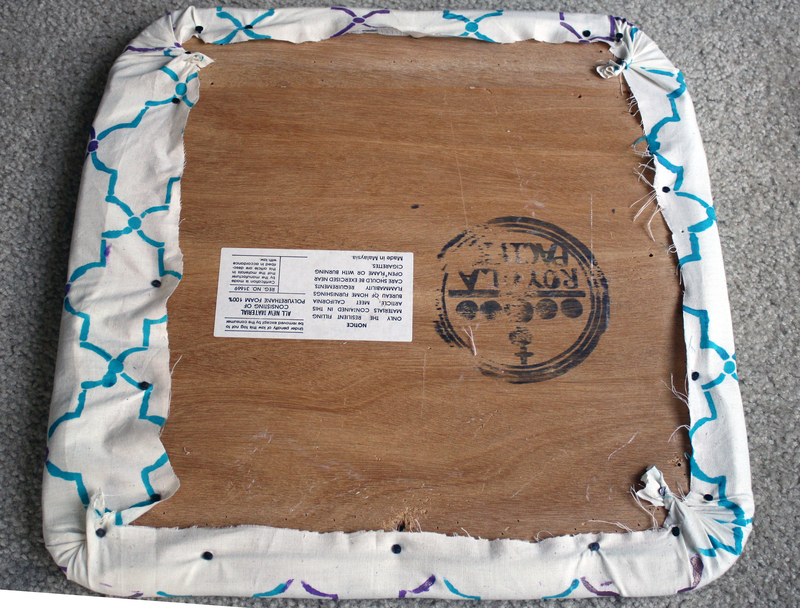 Many local DIY companies buy their products from Zenith. The store has a website, but it is more for information, McCarty said. 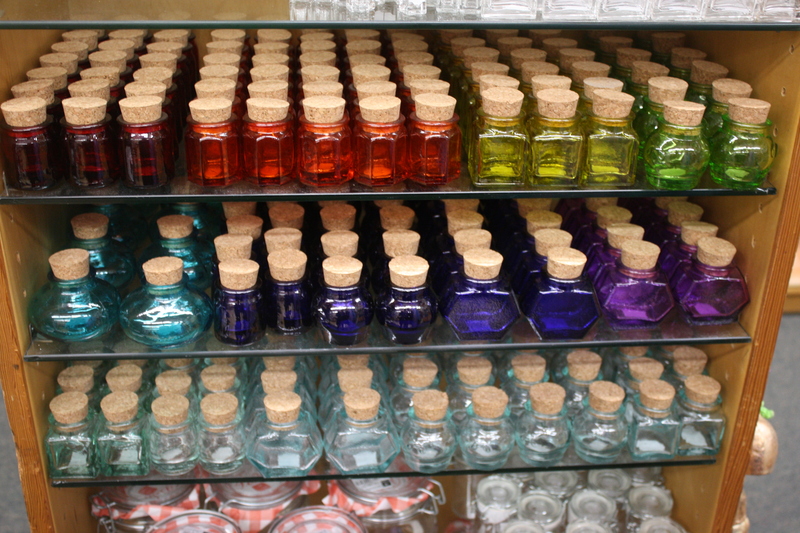 I would love to get one of these cute containers filled with handmade body care products as a gift. They’re so cute. “We’re a brick-and-mortar-based not web-based,” she said. The competition with the online world has been one of the stores biggest struggles. They try to fight the competition of inexpensive products online by trying to ensure their products like their essential oils are totally pure. Even though they can’t compete with the online prices, they do try to keep their products inexpensive, McCarty said, but it is the in-store experience that really is their selling point. Despite the new online competition, McCarty said new interest in DIY and more people training in massage therapy has kept the business successful. In the beginning, Griffis worked hard to establish a solid customer base, and that’s something they still work on. McCarty said they hope the personal experience will keep customers coming back instead of switching to online shopping. 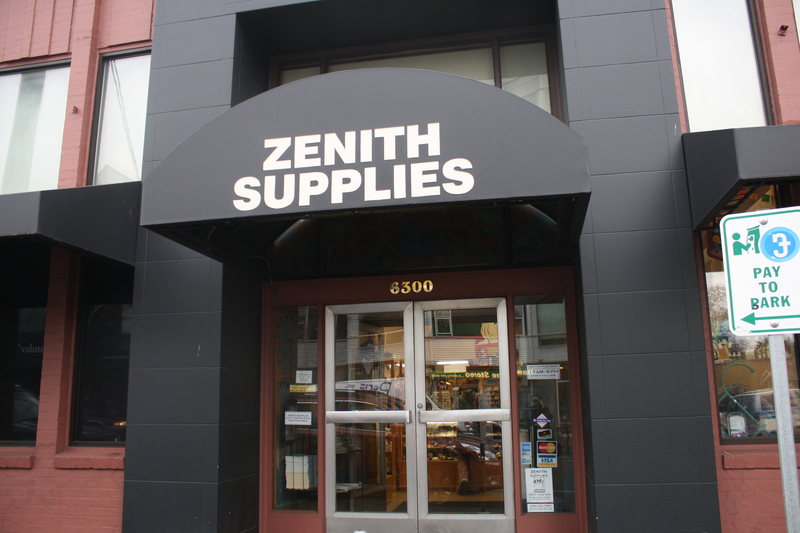 Zenith has been at it’s current location for 20 years. What was once an old bank, has been turned into an open shopping space, with art-deco molding running along the tops of the walls and egyptian style paintings throughout the store. This is a good area for a store like Zenith, according to McCarty. There are a lot of new-age shops and craft stores around so the shop fits in with it’s neighbors. The employees do not work on commission. McCarty said it is better that they don’t work in a sales driven environment because each employee works with the products they sell and they can help customers with their product knowledge. Liz McCarty has worked for Zenith for the past four years. McCarty, who calls herself a ‘perfume nerd,’ has been creating body care products for about 10 years for her friends and family. In a world of ‘big box stores’ McCarty said their success is a testament to the store. 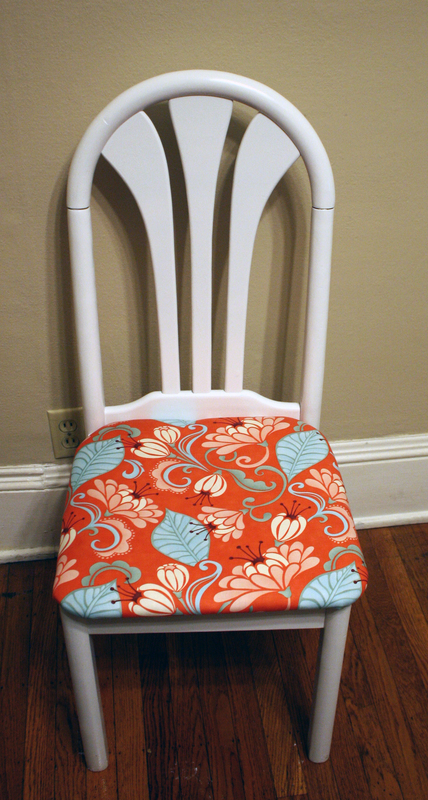 Remember that fabric I hand-painted last week? (More on that here.) Well I put it to use and I’m pretty happy with the result. It all starts with this chair. 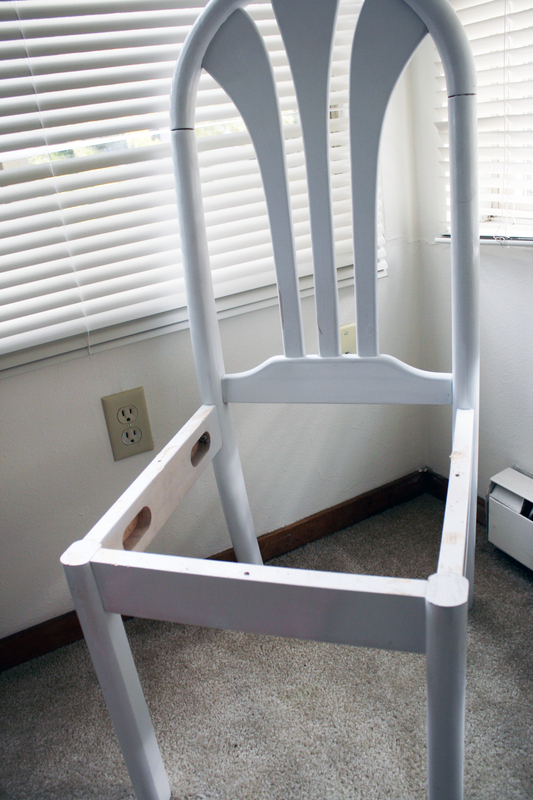 It didn’t look too pretty here, when I first bought this chair from Goodwill a year ago for $2. 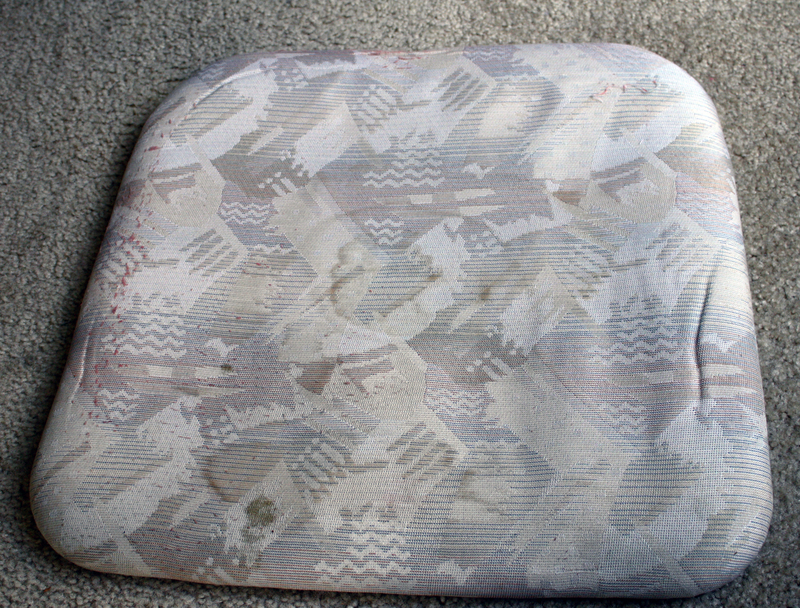 It was scratched up and had horrible fabric. 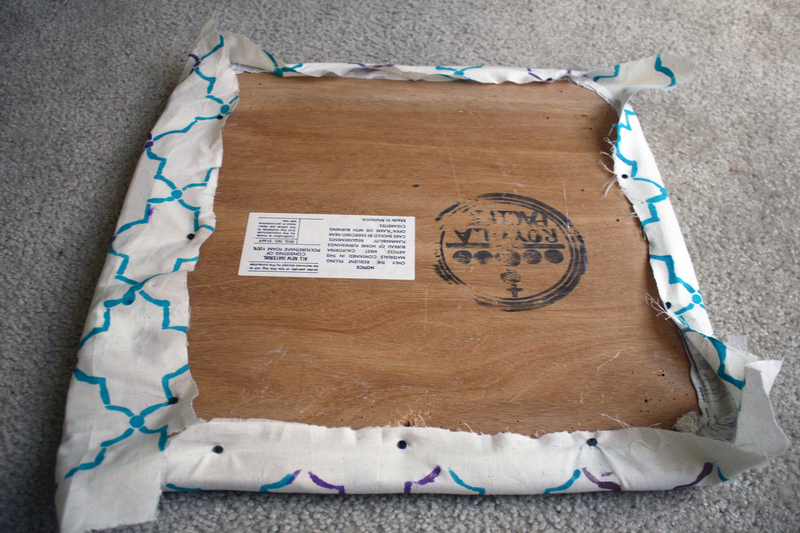 I gave it a once over with sandpaper and hit it with a can of white spray paint. 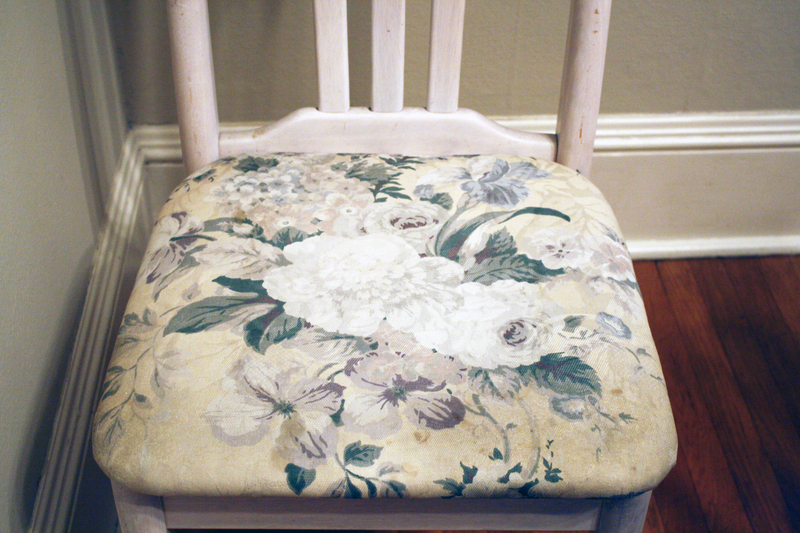 Then I took the upholstery off and covered it with fabric I was using for my room. It looked so much better. It looked great in my old bedroom where it matched my decor. 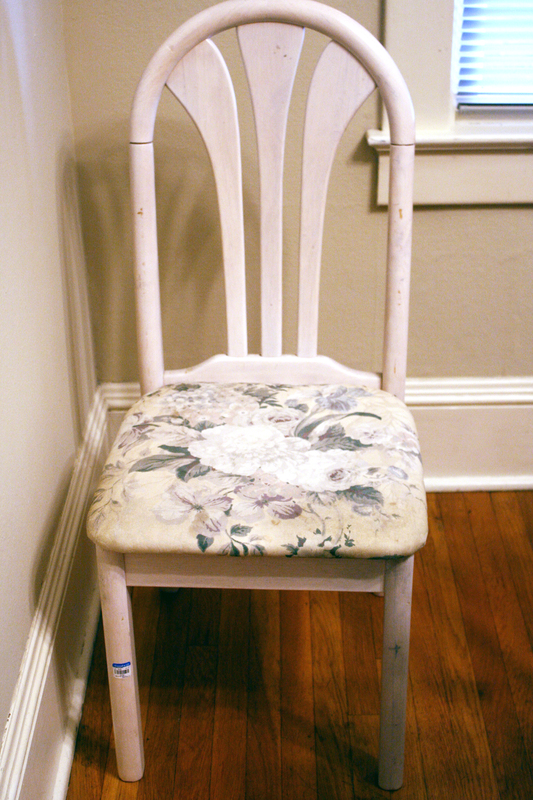 But after a year of being used every day as a computer chair, and then being moved to a room where it no longer matched, it was time for another DIY reupholster makeover. So I removed the seat. 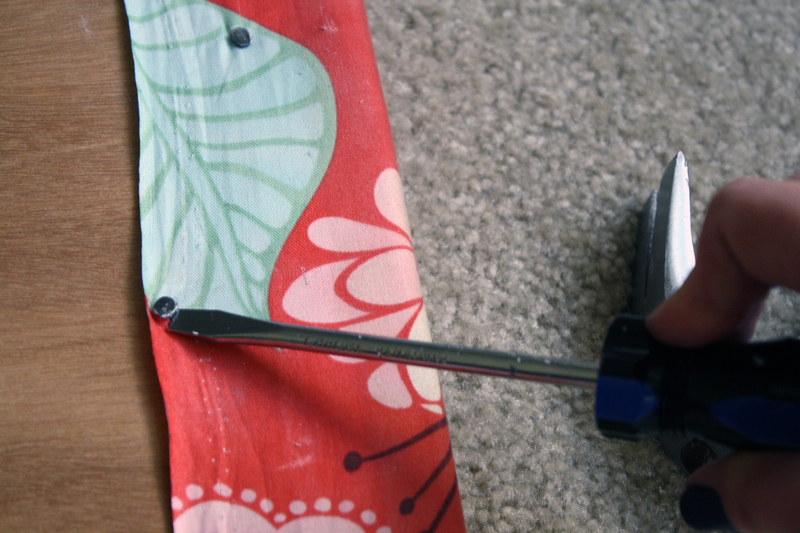 I then removed the reupholstery nails I had used before, with a flat head screwdriver. This is what lies beneath the fabric. It’s not a pretty sight. So once again I put my fabric down to recover it. 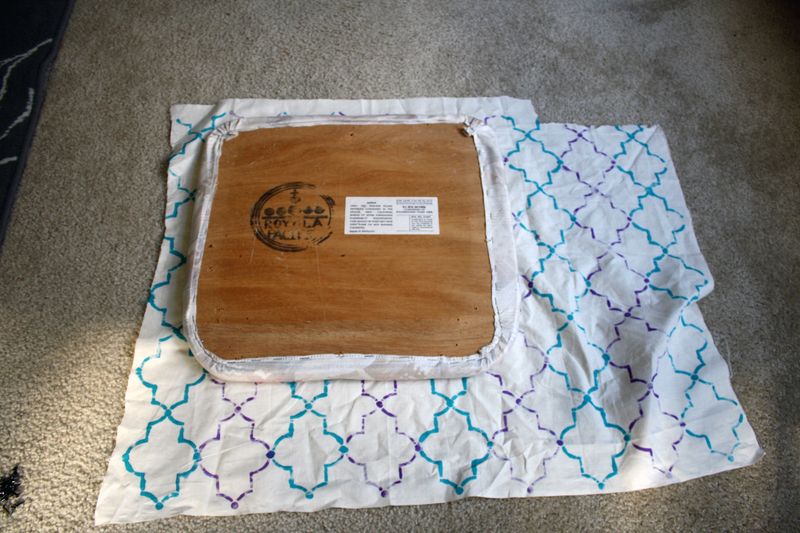 Lay the fabric with the right side facing the floor and place the seat face down on the wrong side. Once the first side is done, it’s time to move on to the opposite side. The most important thing to remember is to keep things pulled really tight every time you put a nail in. 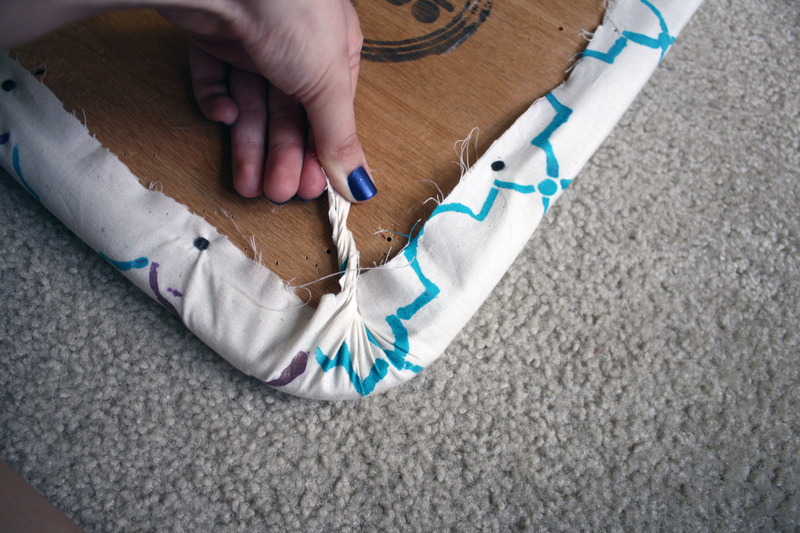 This ensures there will be no wrinkles or loose fabric when you’re done. Make sure you cut off any excess fabric at this point. Once you secure all of the sides it should look like this. Then it’s time to secure the corners. This may not be the most professional way, but the way I’ve had the most success is to twist the corners together, pull tight, and then nail in place. 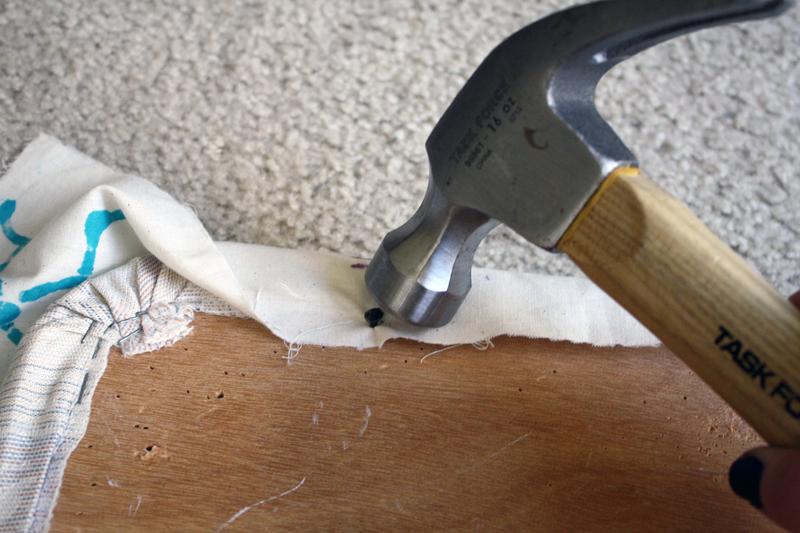 After that I put an upholstery nail on either side of the twist where the fabric was poofed up away from the wood. When you’re done, the back should look something like this. From start to finish this took me under an hour. As you can see, everything looks tight and in place, even though the underside doesn’t look perfect, that’s ok as long as the fabric looks tight and secure. I’d like to get a throw pillow to add to the chair for some added comfort. 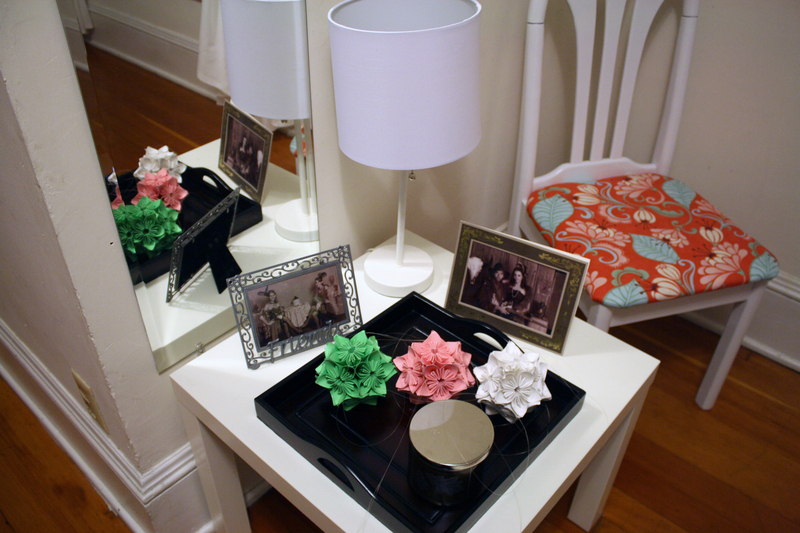 I’d also like to eventually get a side table to add to this side of the room. 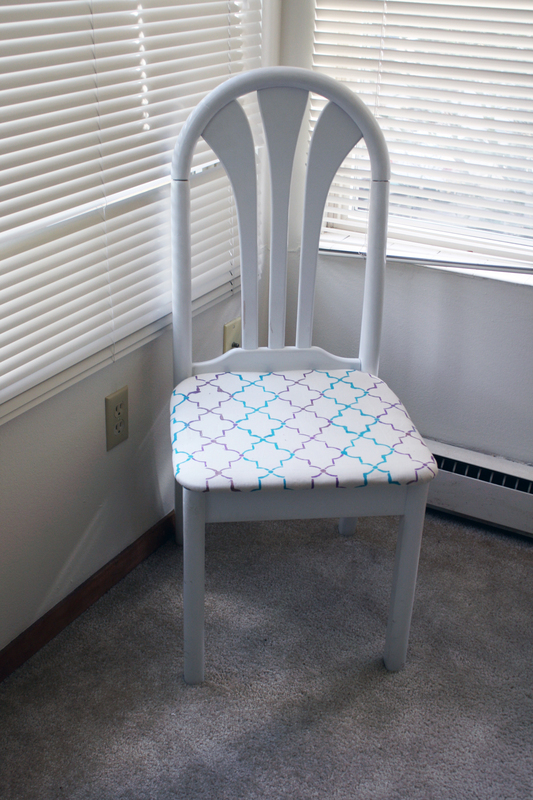 But overall, I’m really happy with my new and improved chair that didn’t cost me a penny. Who doesn’t love a good before and after? 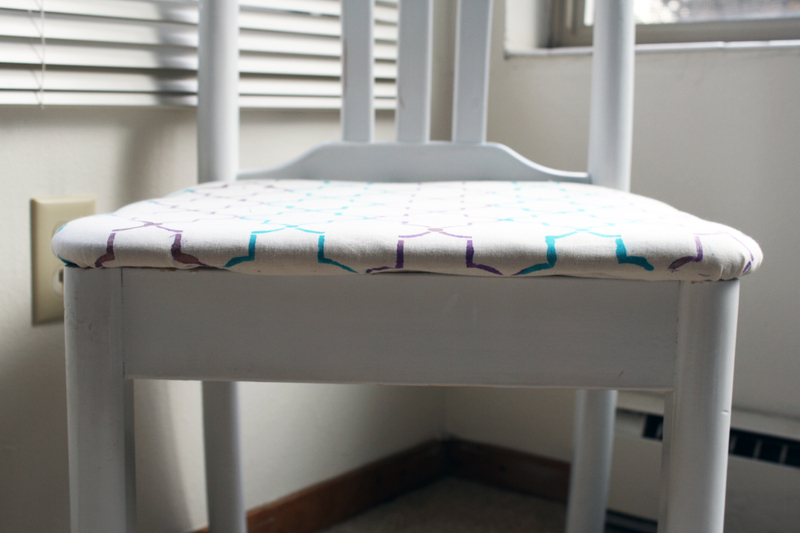 Have you done any DIY upholstering lately? 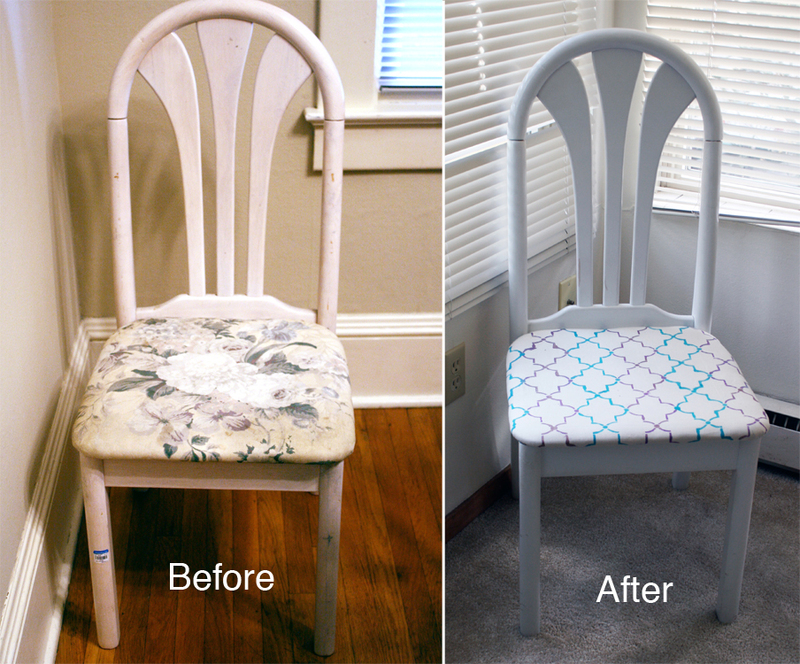 Have you ever re-done a DIY project? Let me know in the comment section.